Pre- registration online is at http://www.fallasburg.org or at the Fallasburg Covered Bridge Bike Tour page for $25 per individual, $35 for family before July 6th. After the deadline and in person, there will be an additional $5 charge. Although the main reason to bike any of the routes is fitness, the camaraderie and feeling of accomplishment and adventure of a bicycle tour with friends or family is even better. “It is exhilarating and exciting to set out on a journey and successfully attain your goal, whether it be 12 miles, 28 miles, 50 miles or 100,” said Tamke. The Covered Bridge Bike Tour has grown from just a handful of registrants to 253 registrants last year. But, 250 registrants means 300 plus riders as family registrations can cover multiple riders. “We’ve had modest gains, with more people joining the fun each year,” said Tamke. The riders can select the distance they wish to ride from 12 miles to 100. They can also combine routes to get some variety. The 12-mile route climbs up Covered Bridge Road, over MacPherson to Sayles, then along the Flat River into Lowell and back to the village via Lincoln Lake. The 28-mile route travels into Lowell along Lincoln Lake, then west along Grand River to Ada Park. The half-way point and rest stop is at the Ada Covered Bridge. The route follows the same path back to Fallasburg. The 50-mile route south follows the same route as the 28, but turns south at Buttrick and heads down to 100th, then back east to Alden Nash and back up to Lowell and Lincoln Lake. The 50-mile north route follows briefly the same path as the 12, but continues on into Ionia with a rest stop at the Blanchard House, then on to Saranac and back to Lowell along Riverside and eventually to the Fallasburg Village. Last year approximately 20 riders completed the 100. They do the South 50 in the morning and the North 50 in the afternoon. Registration at the one-room schoolhouse museum. All proceeds from the bike tour go for the continued preservation of Fallasburg Village. The historical society uses the funds to maintain properties and implement educational programs. Fallasburg Historical Society is an all-volunteer organization so monies collected don’t pay a salary, but pay to fix things and teach people about Fallasburg history. All routes begin and end in Fallasburg Village. The Misner House is the command center and serves as an outdoor lunchroom. Dorothy “Dottie” Blain cooks a country-style Italian spaghetti and meatball feast and its vegetarian version with garlic bread and strawberry shortcake for dessert. “Our riders absolutely rave about our food,” said Tamke. Additionally, all routes offer home-baked goodies, fruit and water or Gatorade at rest stops along the way. Each route has a rest stop. Late Priscilla Lussmeyer came up with the idea of having a bike ride as a fundraiser for the society 22 years ago. She enlisted the help of one of her many friends who was into biking as a means to raise money for the society. It has grown steadily from there. Tamke is hoping for 275 registrants and over 300 riders, 75 degrees, sunny and no humidity or wind – a perfect West Michigan day. “I hope no one gets hurt, everyone has a fantastic time and tell all their friends about it so they can participate in the 23rd annual Fallasburg Covered Bridge Bike Tour,” said Tamke. Tour options (in miles): 12, 28, 40, 50, 62, 78 or 100. Registration fee: $25 for individuals / $35 for families. From Lowell: North approximately 3 miles to Fallasburg Park Drive. Right to entrance of park. Angle right on Covered Bridge Road. Over covered bridge to schoolhouse. Park in field across the street. There will be county road signs on Lincoln Lake Road and Fallasburg Park Drive, alerting you to Park/Bridge/Historic Village. 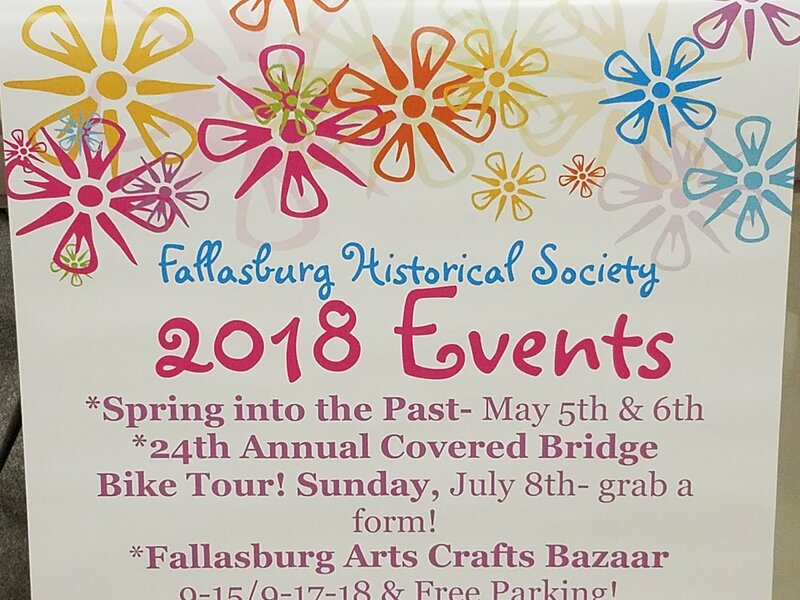 Follow FHS and the Fallasburg Covered Bridge Bike Tour on twitter @fallasburg #fallasburg #fallasburgbiketour #fallasburghistory #fallas and other social media. Copyright (c) 2016. Emma Blogs, LLC. All rights reserved.